A sophisticated tunnel control system and train signal system guide tunnel operations. 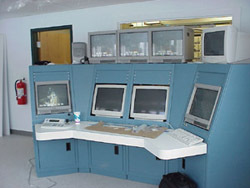 Although concrete and steel may be the most obvious additions to the tunnel, two complex computer systems are dedicated to help the tunnel operations staff operate the tunnel in a safe and efficient manner. One of the most complicated aspects of tunnel construction and operation is the Tunnel Control System (TCS) and Train Signal System (TSS). These two computer-based systems make it possible for cars and trains to safely take turns traveling through the tunnel. The TCS is responsible for all vehicle movement within the tunnel. An intelligent traffic system, the TCS tracks each vehicle and meters traffic through the tunnel. One of its main functions is to monitor the direction of vehicle movement and, through its control of the traffic signals and gates, allow vehicles to travel only in one direction at a time. The TCS also monitors tunnel operations via live video covering the length of the tunnel. If a car stops for any reason, the vehicle detection equipment will alert the tunnel control operator in the Tunnel Control Center, direct the video cameras automatically to display that area of the tunnel, and shut appropriate gates. The TCS also continually monitors and adjusts the lighting and ventilation systems. In a similar fashion, the TSS is responsible for train movement through the tunnel. This system controls train switches and signals and ensures that trains only move through the tunnel in one direction at a time and only when there are no vehicles in the tunnel. Because these systems are linked, the TCS and TSS together ensure that cars and trains never meet in the tunnel. When the tunnel is in the railroad mode, the TSS controls the trains and locks out the operation of the TCS system. All highway gates are closed and the highway signals are set to red. When the tunnel is in the highway mode, the TCS locks out the TSS until highway vehicles are cleared from the tunnel. Alaska Railroad train entering Bear Valley portal building.